when she writes: 100 ACTIVITIES THAT WILL GET YOU OFF YOUR COUCH... RIGHT NOW! 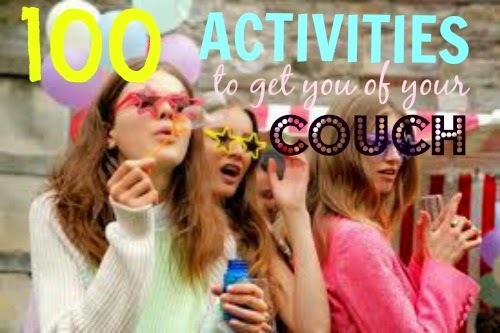 100 ACTIVITIES THAT WILL GET YOU OFF YOUR COUCH... RIGHT NOW! Happy Monday All! I know not everyone likes Mondays, sometimes we just feel like wrapping ourselves up in the sheets and hibernating there and sometimes we feel like sitting in front of the TV until it reaches the weekend. To be honest, we are spending more and more time surrounded by technology and less time getting up and doing something productive with our time. There are so, so many things that we can do that is a bit different and out of our ordinary routines. These are the types of things that make life just that little bit more exciting! Because of this, I decided that I would make a list complete to do just that. Some of these are a little crazy some of this are reasonable but fun, but all of them are doable! You can turn these into a bucket list or just something to fill in your free time but I CHALLENGE all of you to do at least one of them by the end of this week. That has got to be my longest list post ever! I definitely want to try these out! Please let me know in the comments below which ones you will be trying. Have an amazing week! Yay! i am so lad that you are getting involved! Go by movies alone..no..those are the creepy people I think and what's fun in that..I spend a lot of time alone in my room though so that's done.. Volunteer..I did last year..would love to this year as well..check? i don't think anyone has ever written such a long comment on my blog before! Thank you! you seem to have done a lot of these! Thanks Dian! Cooking and baking is actually really fun , you should try it! Thanks Jess! i appreciate all of your comments! I am having a great day thank you! I will be in touch soon! I am so happy that you want to do this! hope you have a great day! Ah perfect I needed this reminder for sure that it's good in fact great to get out of your cocoon for a while! Great list too I shall start doing many of them off the bat! I second that! I will join you in join as many as possible! I am thrilled that you like them! Seems fun, I'm definitely going to try a few! This is great! Love it so much! Great Read! Especially for a Monday :) Loving the look of your blog!